of what is and is not ok to feed kids? Or how about the day that I made these Blueberry Cheesecake Bites and Kenya said, "Grandpa took me to the Cheesecake Factory. I love cheesecake." Now, I have nothing against cheesecake -- it was one of my favorite desserts as a kid -- but I get cavities just thinking about the mounds of sugar that most recipes call for. This version is different and has become one of my kids' new favorite sweet treats. Since they are bite-sized, contain no refined sugar, have tons of fresh blueberries and even a whole wheat and oat crust, I feel a lot better offering these to my kids for dessert than a lot of the alternatives. 2. To make the crust, place the first 3 ingredients in a food processor and pulse to chop oats. 3. Add the butter and pulse to combine. 4. Press the crust on the bottom of a parchment-lined 8 x 8 baking dish and flatten evenly with your hands. Bake for 10 minutes to set, then allow to cool. 5. Lower the oven temperature to 250 F.
6. To make the filling, place the first 5 ingredients in a bowl and beat to combine. 7. Fold in the blueberries. 8. Pour the batter on top of the crust and bake for 1 hour. 9. Cool and then chill until ready to serve. *To get clean squares, wipe your knife between each slice. I completely hear you about \"grandparents\". My MIL feels it necessary to buy my son dixie cups despite how many times I tell her not to as it goes right in the garbage. We're all for our son having ice cream, but acutal ice cream not whatever is in dixie cups. ugh. 15 pieces of gum! Euccchh. Could I use frozen blueberries? I haven't tried frozen, but as long as you fold them in while still frozen they should be fine! Ladies, the love and memories that those grandparents are making with your children are far more valuable than the occasional \"no-no\" (or 15 pieces of no-no) they may be allowing them to have. Lighten up and be grateful that your children have them in their lives. I agree with Grammy! Lighten up a bit and let them have fun with their grandparents. It's all about moderation. You can't always dictate what goes into your kids' mouths. Yum! Going to make these tonight. I can't imagine the horror of walking in to see 15 empty gum wrappers and the realization that the contents of said wrappers were in your daughter's \"tummy\"...oh the horror! I guess you could give them double doses of wheat germ, flax seed and fruit to hopefully counteract the gum and soda. =) cant wait to make these this weekend... too funny about grandparents! im just learning that with my dad =) but its all out of love =) and i figure if shes getting the healthy stuff with mommy a few not so \"good\" stuff is okay! p.s. my daughter is pointing at this pic and saying mmmmm =) yay!! I am a little confused because you say that there is not refined sugar in this recipe - but as far as I know light brown sugar IS refined sugar. Can pure cane sugar or honey be used?? Yes, I was thinking the same thing. I love these recipes but to claim something is refined-sugar-free and then call for brown sugar in the ingredient list feels a little deceitful to me. 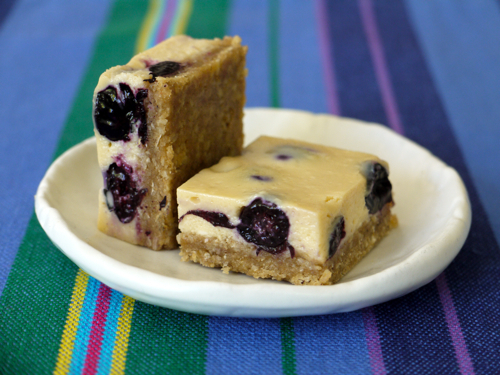 I have been looking for a delicious way to use up some blueberries...this looks perfect! Do you think if I doubled the recipe it would work in a 13x9 pan? I used 1/4 cup honey in the filling instead of the brown sugar and they tasted great. I might try honey in the crust instead of the sugar next time too - I suspect it will turn out well. Oh no! I go ahead and let the grandparents spoil my kids from time to time, but gum is a total no-no, period... I could list a ton of reasons but I'll stick with the fact that I do not want to clean it out of carpet, hair, or the couch. Grandparents can spoil and be respectful at the same time. This is not the season for fresh berries where i live. How can i prepare it with layer of strawberry/blueberry jam. Shall i do the same and add the layer of jam on top just the last 10 mins before taking it out of the oven? I confused on the sugar thing as well. I thought it was all refined. I don't mind just curious. These look so incredibly yummy! I'm drooling! We have fresh frozen blueberries from my grandmothers bushes and I can'twait to use them in this recipe. You are the best Catherine! That is funny you say this. I was just telling my mother how upset I am with my mil. She feels she needs to show her love with pie cake cookies and ice cream. Whack means my twinge old is like a wild child time ten. I asked her if she could show her love without sugar. She said no. I don't see him that often. It takes about 24 hrs to get the suagar out of his system. I used to worry more about the junk food my mom gives the kids, but I figure that's part of what makes granny and grampy so special. I prepare for weekend visits to their place by feeding the kids extra-healthy through the week. That being said, it bothered me more when they were toddlers. I still don't go for the cola though, and my mom generally agrees on that. Sugar wise, depends on the sugar. Natural brown sugar isn't considered refined, where as the store brand more than likely is. As long as we're on a sugar talk, I find it funny that so many recipes call for Agave syrup and people swear by it, yet its considered *bad* as it contains high amounts of fructose....so none of us are perfect on the sugar train. Have to say, I definately plan to try these cheesecakes out. My DD has a new found love of blueberries, but only if they are cooked into something, so this should be a hit. I appreciate these recipes very much, and totally agree with minimizing children's intake of sugar, preservatives and empty calories. My children very rarely taste pop! However, I also feel that it is important to maintain perspective. While 15 pieces of gum is far less than ideal (!!) it hardly qualifies as horror. There are truly horrific things happening in the world, and we are all so blessed that we are even able to worry about such things as sweetened gum. Informal . something considered bad or tasteless: That wallpaper is a horror. The party was a horror. I feel blessed for all that I have (especially my ability and freedom to speak my mind and use nouns of my choosing), but I also cringe at the thought of 15 wads of gum in my tot's belly. why no more video posted?????? I really like them a lot!!!! Wow Catherine, these look amazing. The photo alone sold me on making these this weekend. Thanks for another great recipe! Does anyone know how you could make the crust without wheat? Any suggestions would be great! I doubled the recipe for a 9x13 glass baking dish and left out the blueberries and added 1 c. mashed pumpkin to the cheesecake mixture (with some pumpkin pie spices). After the cheesecake cooled, I heated some cranberry sauce till it ran and spread a thin layer over the top and cooled in the fridge. They were a big hit with my Australian friends who never eat pumpkin as a sweet dish. These were delicious, probably my favorite weelicious recipe to date and I've tried quite a few. :) However, I did feel that there was too much crust compared to filling (I used an 8x8 pan, but the ones in the photo appear to have thinner crust and more filling than mine did) and the crust didn't get crispy enough with the 10 minutes of pre-baking since it was so thick. I think next time I will keep double the filling but keep the crust the same and use a 9x13 pan. Also, after 60 minutes the filling was still soup so I had to bake for an extra 30 minutes and turn the temp up to 350 for the last 10 minutes. I did use slightly less sugar than called for in the crust (next time I'll just use 1/4 cup packed or try honey instead) and in the filling I substituted 1/4 cup honey for the 1/3 cup sugar (perhaps this contributed to the longer baking time needed). It was still plenty sweet with these adjustments. Oh, and frozen blueberries work great too - no need to defrost or anything (this could have been the baking time cause too, but I often use frozen blueberries in recipes and don't have to adjust the baking times). I will definately make this again and again - thanks! Almost forgot to add that I had to also substitute full-fat Greek yogurt for the sour cream since that's what I had and it seemed to work great. I agree with Sarah and the crust, thought about using the same size pan, but jsut double the filling part. Mine was still a bit gooey in the middle after an hour, but I put it in the frig and it set up really good! Gonna make these again FOR SURE!!! Thanks for this recipe, sooooo good! i made this for my sons second bday party...everyone gobbled it up and wanted more! yes it is a lot of crust...i pat the crust on the bottom and around the sides on my circular springform pan. i made the filling..was way too little..so i doubled it..so the cooking time was about 1hour 40 mins. after cheesecake chilled a bit i added thin layer of strawberry sauce and left it in the fridge over night.. omg it look gorgeous. thanks for the recipe! i am wondering if i need the food processor for this? i don't have one... can't i just mix the crust ingredients as is? I've been exploring for a little for any high quality articles or weblog posts in this sort of space . Exploring in Yahoo I at last stumbled upon this web site. Studying this info So i am happy to exhibit that I've an incredibly just right uncanny feeling I found out exactly what I needed. I so much certainly will make sure to do not overlook this website and give it a glance regularly.